TANJUNG LESUNG, Indonesia — As the white strobe lights flashed hypnotically, the band's lead singer screamed into the crowd: "We are! We are Seventeen! Seventeen!" He then let loose with a long note as the guitarist wailed behind him. Some in the audience clapped as they sat at beachside tables covered in crisp white linens. Others walked casually across the grass. A small boy wandered among the tables, and a woman in a headscarf moved closer to the stage, her cellphone out and ready to capture the memory of this perfect night, a year-end concert at a popular resort on Java island's west coast. And unlike most big waves, which are typically portended by an earthquake's violent shaking, this was a stealth attack. There were no major ground convulsions, no sirens, no text message alerts. Instead, a volcanic island with an ominous name - Anak Krakatau, or "Child of Krakatoa" - rumbled as it has been doing for months before a giant chunk of it apparently broke loose like a rock falling into a tub, silently unleashing disaster. "The perfect atmosphere suddenly changed dramatically in just seconds!" 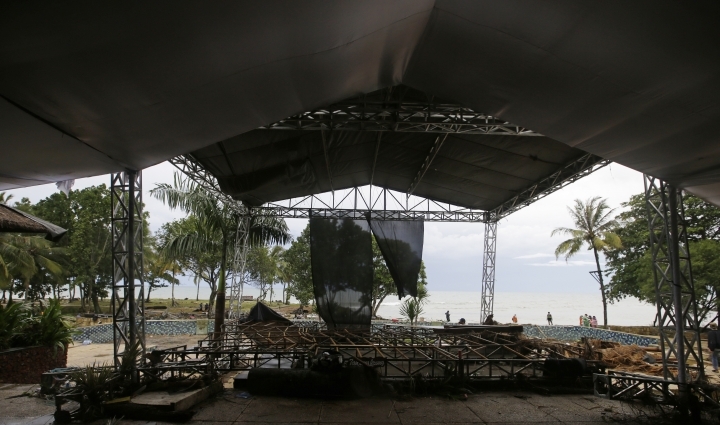 recalled Mamad Setiadi, who had helped set up at the Tanjung Lesung Beach Club for the pop band Seventeen, which performed for employees of a state-owned electric company while a comedian simultaneously had audience members laughing in another area of the lawn. "I saw the seawater suddenly rising and pushing everything on the stage, and I instinctively climbed a tree," he said. "From the top of that tree, I witnessed a horror that is difficult for me to describe in words. The seawater drowned everything ... trees, cars, buses, benches - mixed with men, women and children! The sound of music turned into a hysterical scream!" 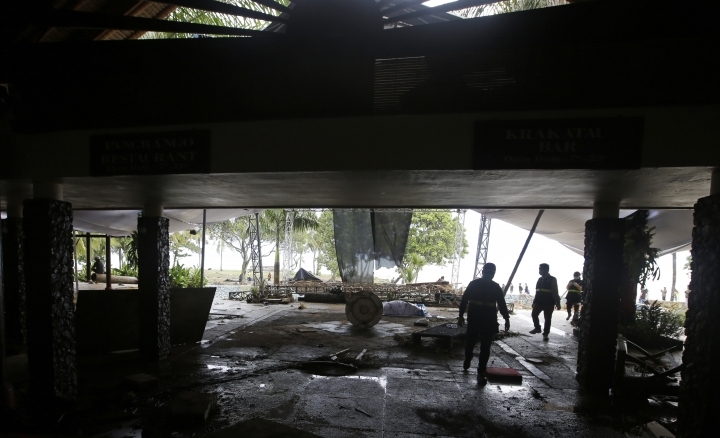 An estimated 500 guests and workers were milling about the resort's grounds when the wall of water surged forward, then sucked back to the sea with such force that survivors had to use all of their strength just to hold on. Seventeen's bass player, guitarist, drummer, road manager and technician were all killed. 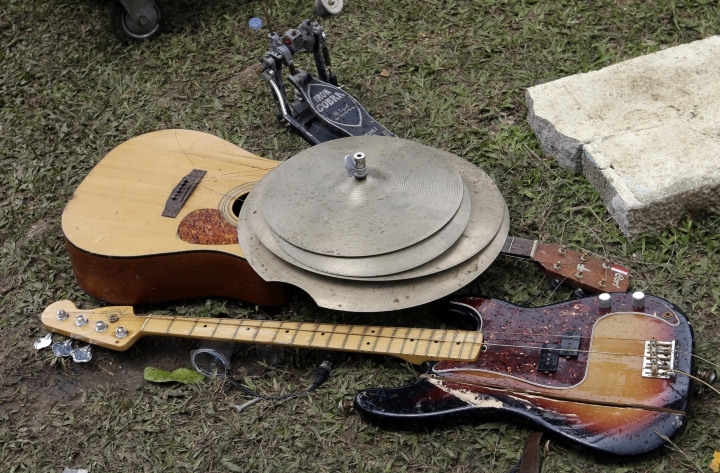 The lead singer, Riefian Fajarsyah, survived, but his wife, a backup singer, was missing. The comedian and his wife were also killed. "Be peaceful there, guys," Fajarsyah wrote in a series of posts on social media, apologizing to his dead friends for missing their funerals as he desperately searched for his wife. "We will not forget you, and we will keep sending our prayers. See you. Until next time." Nearby, only a skeleton of the band's stage remained beside a heap of twisted metal, overturned chairs and splintered sticks of wood. Soggy white tablecloths covered in dirt were strewn across the lawn. Grass and sod were jammed up against a keyboard resting beside broken speakers on the ground. "I'm still here. I'm not going anywhere," he posted online. "I will pick you up. We will go home together, darling. Wait for me, Dylan Sahara." Her body was finally identified at a hospital and flown back to Jakarta early Tuesday along with the drummer's remains. The arrival was met at the airport by celebrities, public figures and a government official who wished to pay their respects. 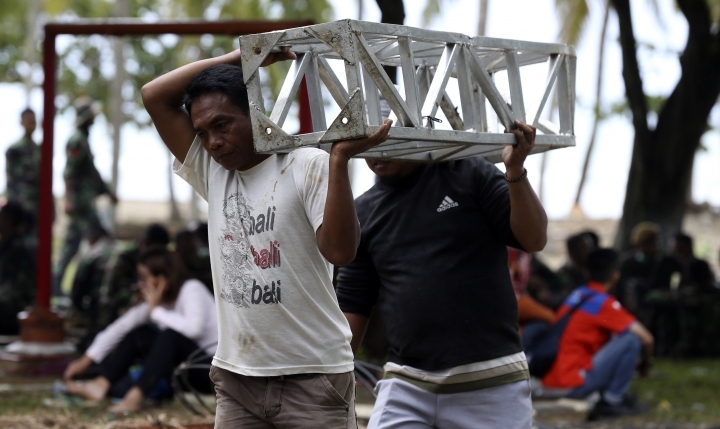 The tsunami did not rise as high or surge as far inland as other waves, including the one that hit Indonesia's Sulawesi island in September, which along with a powerful earthquake killed more than 2,100 people and buried thousands more. But it was still powerful and destructive, with hotels and hundreds of homes heavily damaged or ripped apart. 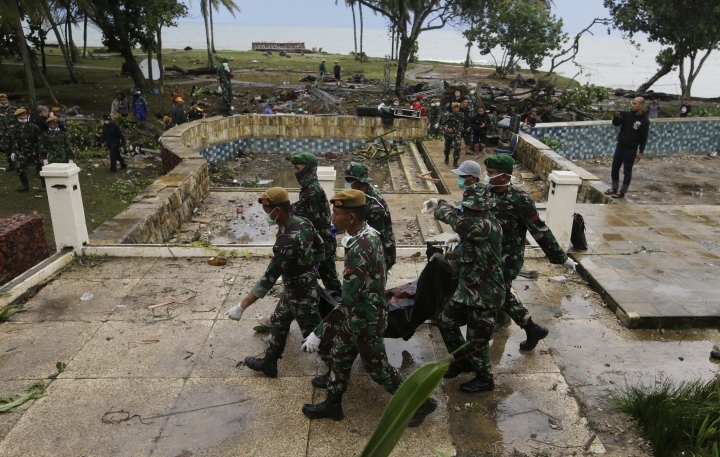 Dwikorita Karnawati, the head of Indonesia's Meteorology, Climatology and Geophysics Agency, said scientists are still working to determine exactly what happened, but the tsunami was probably caused by a landslide on Anak Krakatau's steep slope. The 305-meter-high (1,000-foot-high) volcano lies on an island linking the Indian Ocean and the Java Sea. It has been erupting since June and did so again 24 minutes before the tsunami, the agency said. Satellite imagery showed a 64-hectare (158-acre) deformation on the volcano's southwest side, suggesting the eruption caused a section to break loose, Karnawati added. Other experts have said an underwater landslide also could have been the cause. 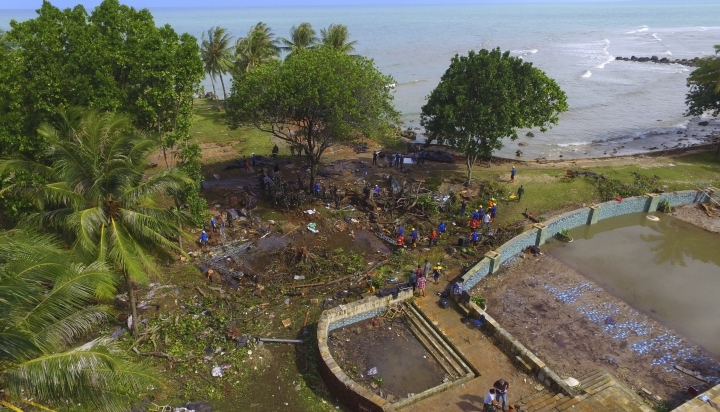 But even in a disaster-prone country where mass casualties are commonly reported, some survivors of Saturday's tsunami said it seemed extra menacing because everything seemed perfect until the second it hit. 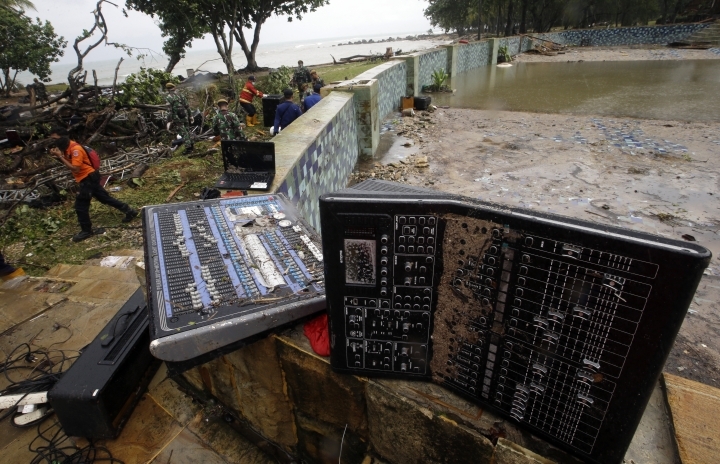 "That night was a nightmare," said Setiadi, the stage crew member who climbed down from the tree after the water receded. He ran home in the darkness, tripping and falling several times over bodies in the street. "I cannot forget it for the rest of my life."